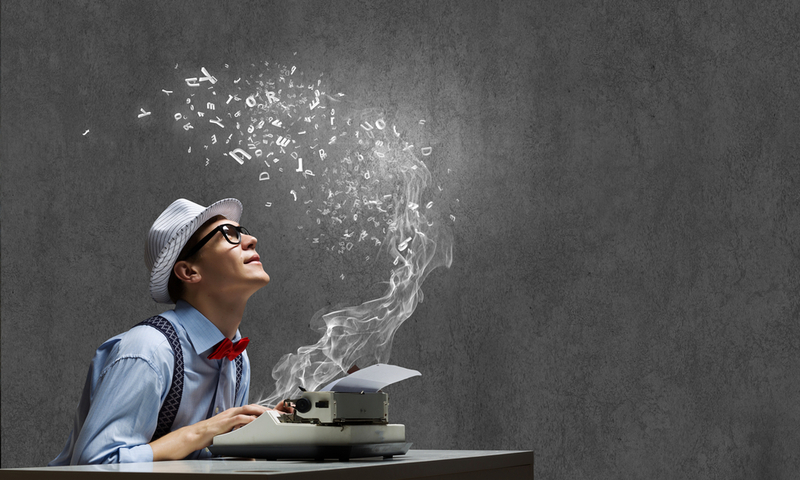 Though writing can be rewarding, it can be a challenge to keep your motivation up day in and day out. Investing in the right writing desk can help to inspire creativity and keep you focused, allowing you to produce your very best work. Here, we’re going to go over the best writing desks on the market that can keep you comfortable and give you the support that you need during your workday. Your brain makes specific associations with each room in your house, meaning that it can be difficult to concentrate in areas used for sleep, eating, or fun. Having a clearly defined space for writing can help you to better focus on your work, and a writing desk is the best way to do this. 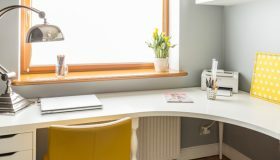 Whether you live in a studio apartment or a four-bedroom house, you can create a workspace that centers around your desk. In addition to boosting your productivity, a writing desk is also the best way to take care of your posture when writing. Sitting on a bed or couch can cause back pain and lead to long-term spinal damage, but sitting upright at a desk keeps your body in a healthy position. A writing desk can also help to ease the pain caused by carpal tunnel syndrome, a condition that’s all too well known to many writers. Using a writing desk keeps your wrists at a healthy angle, preventing you from pinching or damaging any nerves. 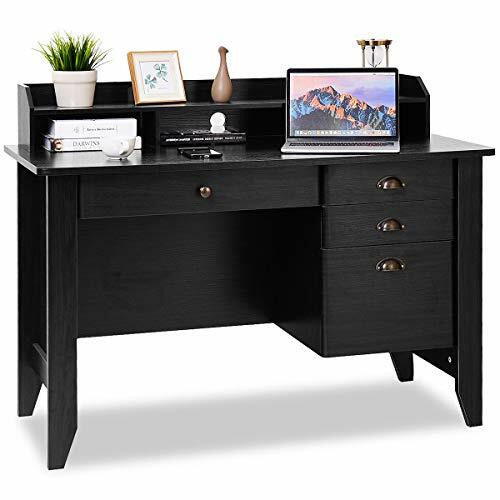 The style of desk that you choose will depend primarily on your writing style. Do you prefer to write with a pen and paper? Do you use a PC? Do you need to keep research materials close at hand when you write? If you write using a computer or laptop, it’s best to look for a desk that’s designed specifically to accommodate a PC setup. Make sure it has enough room for all of the electronics that you need, including space for a computer tower underneath. If you prefer to use pen and paper, the chances are that you need a fairly large work surface where you can spread out. It’s best to choose a roomy desk that can hold everything that you need as you work. You may also want to look for a desk with drawers or shelving to hold other materials such as pens, notebooks, and reference materials. It’s crucial that you do your research before shopping for a new writing desk. We’re going to go over some of the most important things to consider when finding the best writing desk for you. When it comes to writing desks, bigger is usually better. A large, flat surface gives you more room to spread papers out if necessary. You don’t want to opt for a desk that’s too big, though. A desk that takes up can make a room feel cluttered, which is distracting and can harm productivity. Try to look for a writing desk that will fit comfortably in your office or workspace, leaving a few feet for you to maneuver around it safely. You should also consider your own height when looking at writing desks. You want to find one with plenty of legroom, but that won’t place your work materials uncomfortably high. For most people, the ideal height for a writing desk is between 28 and 30 inches. Taller individuals may find this cramped, however, and should look for something that sits 31 inches or higher. Many people prefer wood as the main material of their writing desk. It’s sturdy, elegant, and adds a touch of sophistication to any room. Wood, however, it may not be the best choice for high-traffic areas. It doesn’t take abuse well and tends to show marks and scratches readily. Laminate, on the other hand, has the appearance of wood without the vulnerability. A thick, often clear plastic finish is coated over a wooden base to seal and protect it, creating an attractive yet durable desk. Perhaps the most robust choice of material when it comes to desks is metal such as steel or aluminum. Metal isn’t always the best choice for writing desks, however. The edges tend to be sharp, and the material readily absorbs heat and cold. Metal legs or a metal frame, on the other hand, can help to stabilize a writing desk without making it uncomfortable. Choosing the right writing desk to fit your needs can be a challenge. Fortunately, we’re here to help. Here are some of our favorite desks to help inspire your very best writing. This desk, designed in the mid-century modern style, is designed to offer a sleek all-in-one solution for writers ranging from hobbyists to professional novelists. The desk features a spacious surface measuring 47 by 21 inches. It’s 31 inches in height, making it an ideal choice for taller users. A frame made of poplar legs and birch veneers gives the desk a solid, sturdy construction. An attractive walnut finish completes the piece, giving it a sophisticated look. Writers who are looking for plenty of space can store books, papers, laptops and more in one of two notched side drawer or a conveniently located open center shelf. This desk is ideal for serious writers who need plenty of materials at their disposal when working. It offers ample storage space in a long slide-out drawer and three side drawers. A shelf resting above the desk offers even more storage space. Being out in the open, the open space can also be used to decorate your workspace. The surface of the desk is large enough to hold books, papers, or a laptop with room to spare. It measures 47.5 by 22 inches and stands at 29” tall. The Tangkula Computer Desk is built to last using thick, high-quality MDF board. It’s relatively easy to assemble and includes all of the hardware and instructions that you’ll need. This contemporary desk comes with a stylish antique nutmeg veneer. Not only does this protect the desk from damage, even with heavy use. The desk surface itself is made of particle and MDF board. It measures 55 by 25 inches, making the Glavan desk is ideal for writing in small spaces. The surface offers enough room to use a computer or notebook comfortably and is small enough to tuck away into a corner or cramped room. Black metal legs give the desk support while also adding style with their unique geometric design. The Glavan boasts three spacious drawers for storing work supplies close at hand. Polished bronze handles make it easy to glide each drawer open effortlessly. Finished in Cinnamon Cherry, this stylish desk will be the cure to your writer’s block. 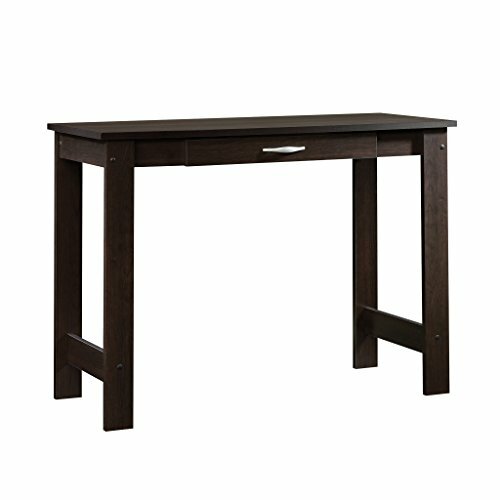 The simple design of this writing table makes it suitable for just about any working environment. It’s got a sleek design and a slim profile, making it easy to fit in tight spaces. The surface measures just 39.25 by 17.5 inches. The desk offers a single slide out drawer for additional storage space. Smooth metal rollers and a polished metal handle make it easy to access whatever you need with ease. Sturdy wooden legs are bolstered by a cross-beam for additional support, ensuring that the desk won’t shift or wobble while you’re trying to write. A cinnamon cherry finish gives the Sauder Beginnings Writing Table a touch of class. The finish also protects the desk from damage from bumps, marks, and environmental damage. This two-tier desk is ideal for writing, whether you use paper or a computer. The desk comes in two sizing options depending on your needs and space constraints, including a 31.5 inch model and a 47.5 inch model. Two large pull-out drawers and two smaller removable drawers offer plenty of extra storage space. The desk also boasts a top shelf where you can store additional items, knick-knacks, and office decor. 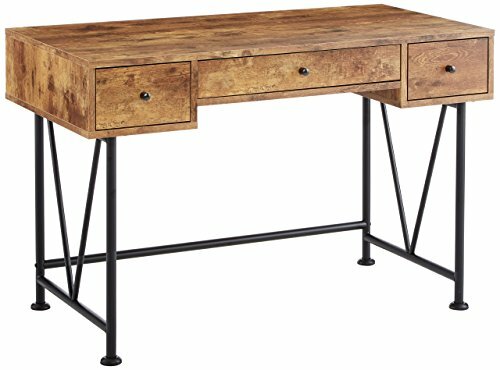 The Giantex Writing Desk has sturdy legs made of solid New Zealand pine, while the body is made of high-quality MDF board. 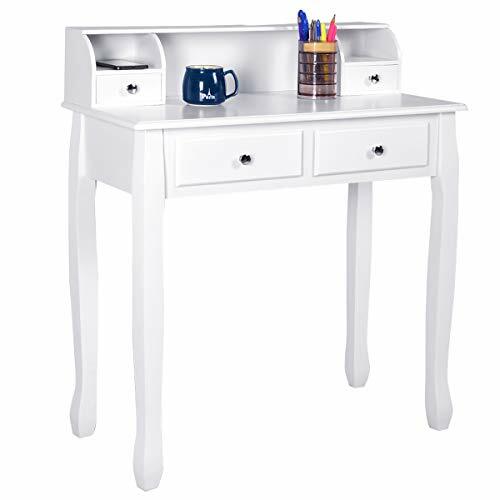 An attractive white finish protects the wood underneath and makes the desk easy to clean with just a damp cloth. 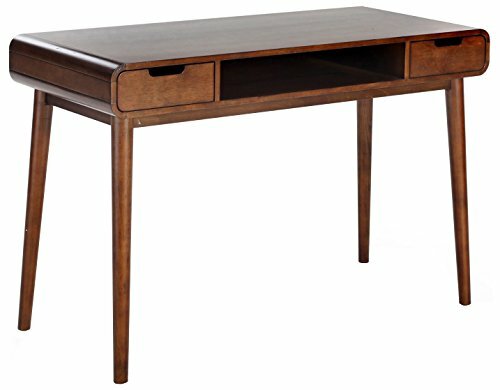 Out of all our top choices of writing desk, our absolute favorite is the Belham Living Carter Mid-Century desk. It offers plenty of space for working, whether you prefer to type on a computer setup or use pen and paper, and both drawers and shelving for storage. When sitting down to write, the right desk can make all the difference. It offers the support that you need to stay comfortable as you work, helping you to stay productive and motivated all day long.